"Cries and screams are music to my audios." Spark date: : January 27. Unit alignment: Decepticon Communications Expert. The ability to hide emotion is not the lack of emotion, Soundwave emulates this to those around him while still expressing how he feels to those closest to him. Head of Communication and still Megatron’s right hand Soundwave has made for himself just what he has wanted. His sparklings are well taken care of and has chosen a mate. That surprised most of the other Decepticons but didn’t come as any news to the Cassettes. He and Raider have produced one Sparkling thus far Audioslave; which is Soundwave’s pride. He has taken to teaching his mate Raider and their new Sparkling how to well tune their telepathy. Increasing its power and helping Raider to control her special abilities. 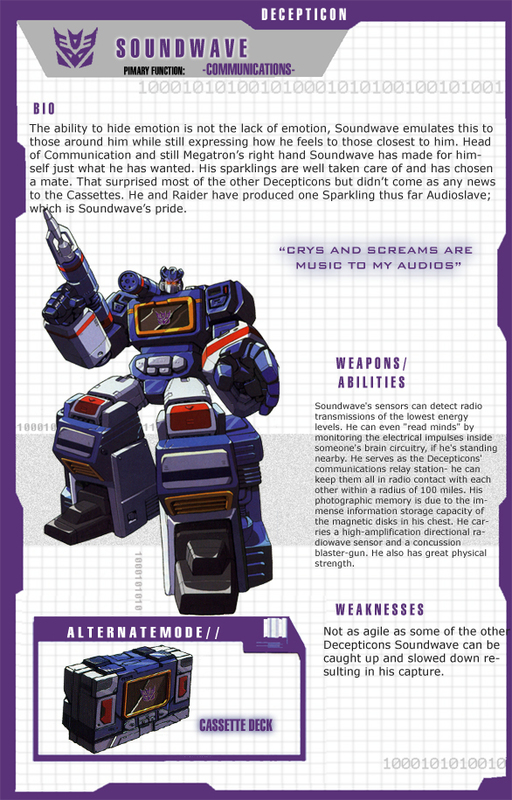 Soundwave’s own abilities are extending as well; his hearing and telepathy can stretch out encompassing nearly all of Kaon. He has taken a role at the Academy as language instructor as well as spy director. Later on if there are others that have manage to pass Hook’s surgeon courses Soundwave has offered to teach what he knows on micro nano circuitry which is nearly considered a lost art. Tall dark and blue Soundwave is fairly boxy even for a Robot, he sports a windowed chest door that opens and closes to dispatch his cassette children. His speakers lay hidden under the armor protected from most weaponry. 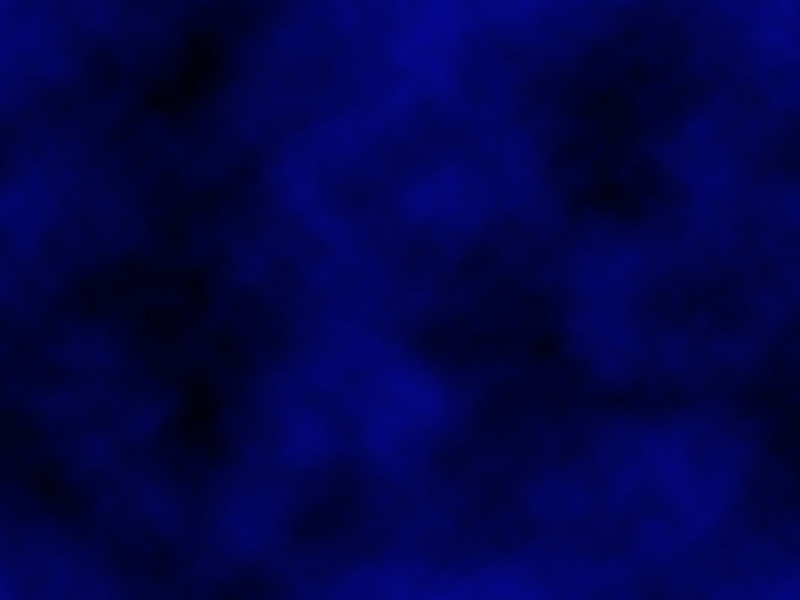 His coloring is navy blue, with silver high lights and some red and yellow pin striping. His visor a bright scarlet red, he also wears a battle mask. Soundwave's sensors can detect radio transmissions of the lowest energy levels. He can even "read minds" by monitoring the electrical impulses inside someone's brain circuitry, if he's standing nearby. He serves as the Decepticons' communications relay station- he can keep them all in radio contact with each other within a radius of 100 miles. His photographic memory is due to the immense information storage capacity of the magnetic disks in his chest. He carries a high-amplification directional radiowave sensor and a concussion blaster-gun. He also has great physical strength. Not as agile as some of the other Decepticons Soundwave can be caught up and slowed down resulting in his capture. Soundwave grew up knowing Megatron is entire life. He thinks of the Decepticon leader as an elder brother like Shockwave. When their parents were also dispatched at the hands of the Autobot elders Soundwave agreed to stay with Megatron and aid him in any way he could. His time in the arena helping Megatron led him to find a femme; she came to the games for entertainment and worked in a lab. She taught him most of what he knew of micro circuits at the time resulting in a semi stable relationship and his first five Cassettes. The conflict escalating into a full out war her lab was destroyed in the process. From that point on Soundwave has kept his cassettes with him constantly. Crashing on Earth opened a whole new realm up for most of the Crew on the Nemesis. Soundwave studied the Earth humans and learned a great deal about them. The introduction of the internet allowed Soundwave to enter homes of those unaware and claim even more information. This led him to the human that have been since turned into Decepticons and now is his mate.